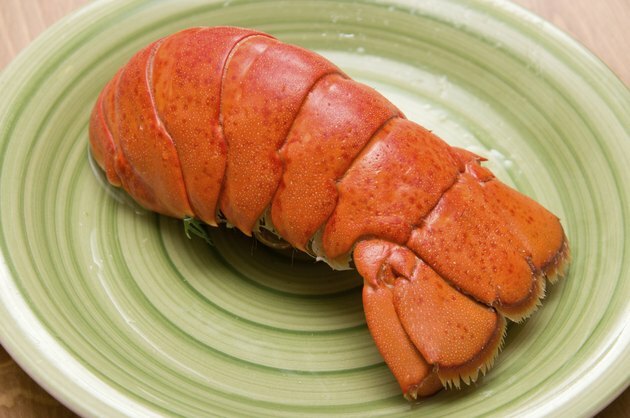 Lobster tails are a delicacy that has little of the culinary work associated with other shellfish. They cook quickly and require few advance preparation steps. Once you cook them, separating the flesh from the shell is a one-step process or, for quick and easy dining, you can skip this step and dive in with your fork. A 4-oz. lobster tail is just the right size for an appetizer or an addition to a healthy salad. Thaw frozen lobster tails in the refrigerator for the best results. Keep fresh lobster tails chilled until ready to cook. Add the water, salt and seaweed to the pot and bring it to a boil. Add the lobster tails to the boiling water and cover the pot when it boils again. Boil the tails for five to eight minutes, or until the shells turn red. Remove the tails from the water and serve or chill. A 1-pound lobster requires approximately 10 minutes to cook, but lobster tails need less time because the flesh is partly exposed.